FROM THE WEBSITE: EACH hospices aren’t just about end of life care; they’re often very happy and fun places, where young people can live life to their full potential. They are places where families feel safe, at home and where they can spend quality time together. EACH supports families and care for children and young people with life-threatening conditions across Cambridgeshire, Essex, Norfolk and Suffolk. Our family-centred approach includes specialist nursing care, symptom management support, short breaks, wellbeing activities, therapies and counselling; all meeting the individual needs of the child, young person and whole family. EACH offers families flexibility and control over where they receive their care and support – at home, in hospital or at one of three hospices at Milton (Cambridge), Quidenham (Norfolk) and The Treehouse (Ipswich). More than half of our care and support is delivered in the family home and community, in surroundings familiar and comfortable for the family. 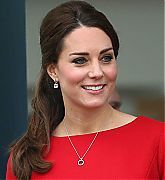 Catherine, Duchess of Cambridge has been since January 2012. 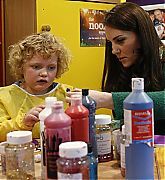 March 19, 2012 – Visiting The Treehouse Children’s Centre – Catherine, Duchess of Cambridge made her first public speech during a visit to open The Treehouse Children’s Hospice in Ipswich, England. 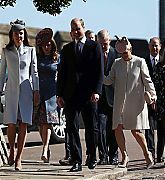 During her visit she also met with families who use the centre, as well as the staff, joined in with the children in their music and art lessons, and planted a tree on the hospice grounds. 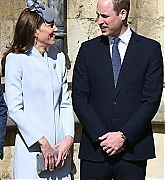 September 13, 2012 – Diamond Jubilee Tour – Day 3 – Prince William, Duke of Cambridge and Catherine, Duchess of Cambridge’s visit Hospis Malaysua during the Diamond Jubilee Tour of South East Asia in Kuala Lumpur, Malaysia. With the attention Catherine brought to EACH they were able to make contact with Hospis Malaysia to develop practices and services. 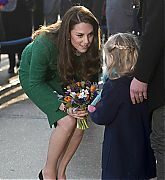 During the visit Catherine gave a speech and met with patients and their families. 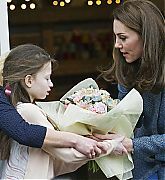 April 29, 2013 – Visiting Naomi House – Catherine, The Duchess Of Cambridge marked Children’s Hospice Week with a visit to Naomi House Children’s Hospice near Winchester, Hampshire, England. 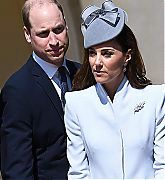 She spent time chatting with volunteers, patient families and supporters. 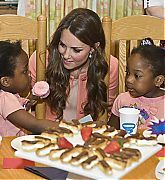 Afterwards she joined brothers and sisters of patients for a tea party. 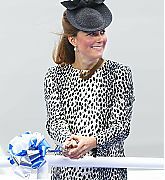 June 13, 2013 – Princess Cruises Ship Naming Ceremony – The Duchess of Cambridge, named Princess Cruises’ newest ship and became Godmother to ‘Royal Princess’. 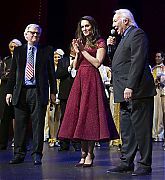 The naming ceremony was the highlight of week-long celebrations to welcome the vessel into service, which included a special naming gala the evening before. A bereaved family, who has received care and support from EACH, were special guests at the naming ceremony and presented Catherine with a pair of scissors to cut the rope for the bottle break. 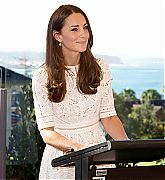 April 18, 2014 – Australia And New Zealand Tour – Day 12 – Catherine, Duchess of Cambridge visits children and relatives at the Bear Cottage Hospice at Manly in Sydney, Australia. 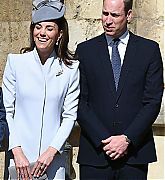 The Duke and Duchess of Cambridge were on a three-week tour of Australia and New Zealand, the first official trip overseas with their son, Prince George of Cambridge. 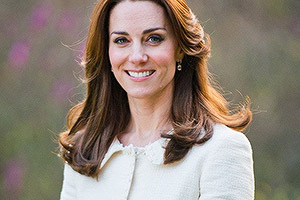 Due to Catherine being Patron of EACH she is able to work with organisations across the world. 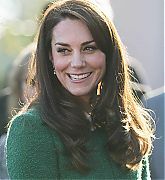 November 25, 2014 – Attending East Anglia’s Children’s Hospices Appeal Launch – Catherine, Duchess of Cambridge attends the East Anglia’s Children’s Hospices (EACH) Norfolk Capital Appeal launch event at the Norfolk Showground in Norwich, England. The event launched a fundraising appeal for a new EACH hospice in Norfolk. 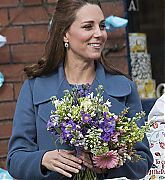 Limited edition mugs by Emma Bridgewater were unveiled to The Duchess who had a hand in the partnership. The mugs will be used to help raise money for the new hospice. 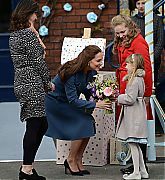 February 18, 2015 – Visiting Emma Bridgewater Factory – Catherine, Duchess of Cambridge visits the Emma Bridgewater factory to see production of a mug the company has launched in support of East Anglia’s Children’s Hospices in Stoke on Trent, England. 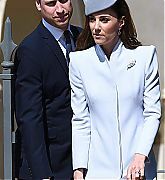 The Duchess was given a tour of the factory. Her Royal Highness was not afraid to get her hands dirty as she tried her hand at making a plate and painting designs on one of the mugs. 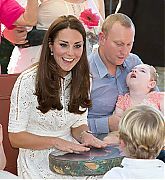 Catherine also met with children and their families from Donna Louise Children’s Hospice. 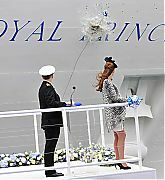 Before her visited ended The Duchess unveiled a plaque to commemorate her visit. 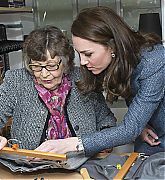 March 18, 2016 – Opening New EACH Charity Shop – Catherine, Duchess of Cambridge spent 45 minutes meeting staff, volunteers, and families helped by the charity, as well as doing a bit of retail therapy, buying a Fireman Sam book for Prince George, The Duchess also spent some time sorting clothing and trying on a hat, as she tooka tour of the new EACH charity shop that she officially opened earlier today in Holt, United Kingdom. 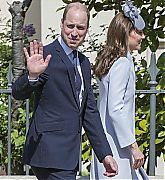 June 22, 2016 – The Duke And Duchess Of Cambridge Attend Gala Dinner To Support EACH Nook Appeal – Catherine, Duchess of Cambridge attends a gala dinner in support of East Anglia’s Children’s Hospices‘ nook appeal at Houghton Hall in King’s Lynn, England. Hosted by David Cholmondeley, the 7th Marquess of Cholmondeley and his wife Sarah, Marchioness of Cholmondeley, at their country home Houghton Hall in Norfolk and titled ‘A Taste of Norfolk” The Duke and Duchess along with other guests were treated to a 5 course meal and musical performances, including a performance from the charity’s Treehouse Choir. The goal of the night was to raise funds for a new hospice, The Nook. 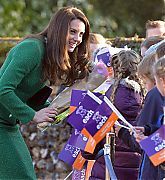 January 24, 2017 – Visits East Anglia’s Children’s Hospice At Quidenham – Catherine, Duchess of Cambridge visited The Nook Appeal at EACH in Quidenham, Norfolk. 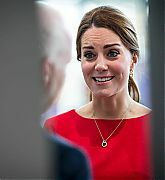 During her visit The Duchess met with staff, volunteers, families, and donors. Received an update on fundraising efforts, and took part in a therapy session with the children. 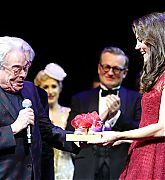 April 04, 2017 – ’42nd Street’ Opening Night Royal Gala In Aid Of EACH – Catherine, Duchess of Cambridge, attends a presentation following the Opening Night Royal Gala performance of ’42nd Street’ in aid of the East Anglia Children’s Hospice at the Theatre Royal Drury Lane in London, England. 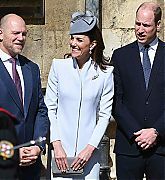 The Duchess was greeted on the red carpet by EACH representatives. After the show Catherine met with the cast and crew and posed for a photograph. She was also presented with a pair of tap shoes from producers and director.